Buzz Culotta, who died much too early at the age of 49 in 2014, coached in RYHA for eight years. He had an unsurpassed passion for the game and devotion to his players. But, he also had a passion for education and always encouraged his players to pursue academic excellence just as they had pursued excellence on the ice. This award is given by Buzz's family and friends in his honor. RYHA Players Eligible for Award: Rising high school juniors and seniors and graduating seniors. Award Criteria: This is a merit based scholarship. The award recipient shall be the player who over the course of the year has most strongly demonstrated: a superior record in his or her academics; the core values of RYHA in his or her hockey play—namely, commitment, hard work, passion, integrity, sportsmanship, team work, having fun, and respect; and participation in volunteer community activities as consistent with his or her academic and hockey commitments. Use of Award Funds: Each applicant must agree in writing that, if given the award, he or she will use the award funds for his or her formal education (e.g., tuition, school fees, schoolbooks) and/or his or her hockey development (e.g., hockey camp fees, personal hockey instruction, RYHA fees). Application/Selection Process: Players who feel they meet the award criteria may apply online by submitting the application at the link below. Applications must be followed with letters of recommendation from the player's team head coach and at least one of the following: 1) High school teacher or school official, or 2) representative from a community organization for which the applicant has volunteered. Applicants must also provide valid school documentation showing current grade point average. Completed applications and supporting documentation will be reviewed by a committee within RYHA, which selects three finalists. The applications of the finalists are submitted to the sponsors of the award (the family and friends of Buzz Culotta) for their selection of the winner. Applications and supporting documentation are due to RYHA no later than February 28, 2019. Please mail your supporting documentation to: Culotta Scholar-Athlete Award, c/o RYHA, P.O. Box 61400, Raleigh NC 27661. Award recipient will be announced in March 2018. The 2016 winner was Logan Cox. Logan played for the Junior Hurricanes U16 AAA American team this past season. He was a junior at Jurius H. Rose High School in Greenville, NC. Logan carried a weighted 4.7 GPA, he was enrolled in several Honors and AP Courses and was an active volunteer in the youth hockey community. Congratulations to Logan Cox. Presenting the award was Laura Culotta and Judge James Gates. The 2015 winner was Lewis Evans. 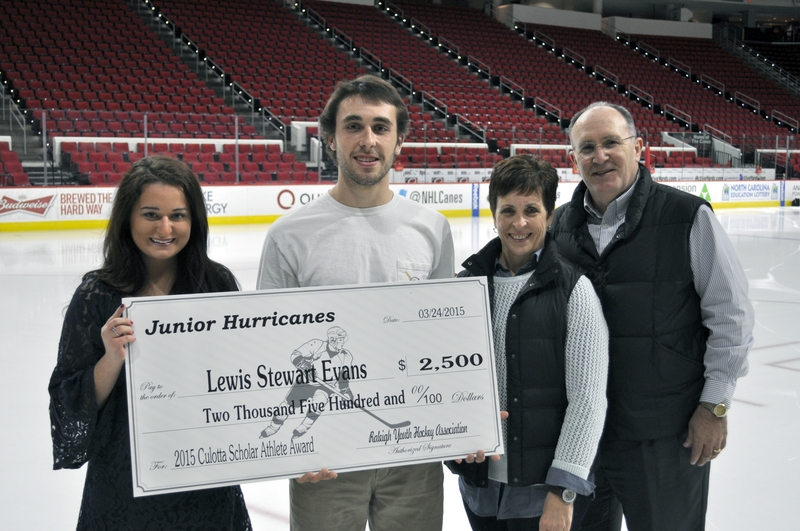 Lewis was a member of our Junior Hurricanes 16U AAA team and junior at Wakefield High School. In addition to his commitment to a rigorous hockey schedule, Lewis works hard to maintain a 4.25 GPA in a challenging schedule of AP and Honors courses at Wakefield. He is also active in school and community service through the school's National Honors Society and Beta Club. Lewis plans to continue his education and hockey career next year at the Brooks College Preparatory School in Massachusetts.